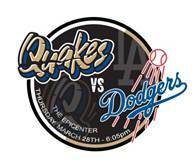 The Los Angeles Dodgers and Single-A Rancho Cucamonga Quakes announced today that the clubs will meet in a seven-inning exhibition game on Thursday, March 28 at 6:05 p.m. at The Epicenter in Rancho Cucamonga. Los Angeles’ split-squad will be managed by Hall of Fame Manager Tommy Lasorda with the roster to be announced at a later date. Tickets for this event are currently only available to Quakes MVPs (Ticket Package Holders). Ticket packages, which include a ticket to the Dodgers’ exhibition game, start at just $89 and can be purchased by calling (909) 481-5000 or online at www.rcquakes.com.